I wasn’t tagged by anyone to do this, but I’ve seen people doing various ‘tag’ posts and they seemed like fun, so I just searched for a music themed one and came across this. It’s something different to my other posts so I thought I’d give it a try. Also before I get into the questions I just want to say thank you so much for the incredible reaction to my last post! I got so many lovely comments and more reads than I’ve ever had, which is more than I could’ve ever expected! I’ve also almost reached 80 followers on bloglovin’ already which is totally unreal, thank you to everyone who takes the time to read my posts and follow me! I have all the albums of my favourite artists, so probably One Direction, Taylor Swift, Olly Murs and Avril Lavigne are the ones I have the most by since they each have about 5 or more albums. I’ve just been listening to the radio on my way back from work so the last song they played was Radioactive by Imagine Dragons. The last song I listened to on my iPod was Into You by Ariana Grande. 3. What’s in your CD player right now? I don’t think there’s a CD in my stereo right now, but the last one I listened to was probably Made In the AM by One Direction as I love blasting that through my speakers in my bedroom! The last concert I went to was Busted back in May, which was really amazing but feels like so long ago now! 5. What was the greatest show you’ve been to? I’ve been to so many amazing concerts but I’d have to say the greatest one ever has to be when I saw One Direction (surprise surprise) at the Millennium Stadium in Cardiff last June. 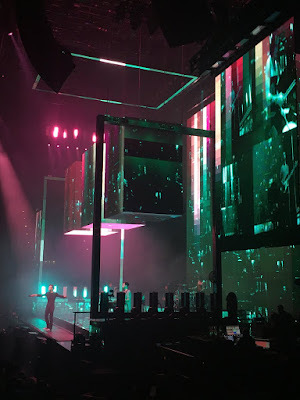 I’ve talked about it in detail before in my post about my top 5 concerts ever (of course this one was number 1!). Being front row of my section was just one of the best experiences I’ve ever had and that’s why this concert is so special to me. 6. What was the worst show you’ve ever been to? I can’t say I’ve ever been to a bad show! Seriously, nothing is coming to mind right now. I can honestly say I have never been disappointed by a concert I’ve been to. Even when my friend basically dragged me to go and see The Vamps with her earlier this year, and we were three rows from the back (I’m really scared of heights), I actually had an amazing time! So I’m very lucky to never have had a ‘worst show’. 7. What is the most musically involved you have ever been? I’m not entirely sure what this question is supposed to mean but I would guess it’s in terms of performing music yourself? In that case, my friend and I entered ‘The X Factor’ in primary school and made it through the auditions but sadly we didn’t win. We even sang What Dreams Are Made Of from the Lizzie Maguire movie. I know, we were robbed. Also I auditioned for our primary school play of Grease in year 6 (when I was about 10) and sang Hopelessly Devoted to You on my own (a very hard song to sing), put myself through all that nervousness and stress and thought I did amazingly for having practically zero singing experience apart from into my hairbrush in my room. Sadly I didn’t get the part of Sandy. In fact, I didn’t get any significant part. They had to invent a character for me to play as there were too many people in our class, and I got a grand total of one line. I’m still not really over it. As I mentioned in a previous post, I’m going to see Bastille and The 1975 in November and December, both of which I’m really excited for as I’ve never seen either of them before and always wanted to! 9. What is your favourite band shirt? Extremely predictable answer, but I love my One Direction t shirt from the On the Road Again tour last year. It’s so cosy and a perfect fit whereas most of my other concert t shirts are way too big even though they’re a size small. 10. What musician would you like to hang out with for a day? This is SUCH a hard question! I would love to hang out with all my favourite artists… but I’m going to have to go with Harry Styles (once again, who would have guessed?!). I’ve loved Harry since his first audition on X Factor almost 6 years ago, even before One Direction was formed! I’d love to spend a day just chilling with him and talking about normal things without screaming girls mobbing him left right and centre. Yes, I’d probably be screaming on the inside but I’d try my best to hold it together. I’d love the chance to get to know him properly as a person, although I’ve admired and loved him for six years I don’t and probably will never truly know him on a personal level, so it would be amazing to have that chance. 11. Who is one musician or group you wish would make a comeback? I’ve mentioned a few times before that I was a huge Jonas Brothers fan when I was younger, and it still makes me nostalgic and emotional hearing their songs now. So I’d definitely be hyped if they ever decided to get back together since I was so sad when they broke up. 12. Who is one band/ artist you’ve never seen live but always wanted to? The funny thing is that the only two bands I’ve never seen live but have been on my concert bucket list for ages are Bastille and The 1975, and as I’ve mentioned I’m lucky enough to be seeing them both very soon! After that I don’t think there’s anyone I haven’t seen live that I want to, how incredible is that?! It’s very rare for me to say that an album is flawless, as there’s usually one song that I’ll skip when I’m listening to it. However, these at the moment are the only four albums that come to mind on which I adore every single song and can listen to the whole way through without even thinking about pressing the skip button. 14. How many concerts have you been to, total? Gosh, now that’s a good question. Far too many to count. I’ve just attempted it and got to 28, but I’m sure I’ve missed a few out so the figure is probably in the 30’s. 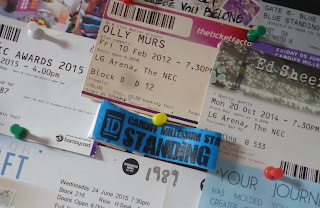 I’ve seen Olly Murs and Lawson five times each, One Direction six times and a lot more of my favourite artists which you can read all about in some of my previous posts. I definitely am a concert addict, I can’t handle not having a concert planned to look forward to! 15. Who have you seen the most live? Oh. I’ve just answered this question. What a surprise, it’s One Direction. I’ve seen them on every one of their four tours, twice on the last tour and once at the BBC Music Awards last December. 16. What is your favourite movie soundtrack? To be honest I don’t really listen to movie soundtracks but one that I did buy on CD was The Fault in Our Stars. I loved the movie and the music in it I thought was really good and made the story come alive. I was worried when I went to see it how it would measure up to the book, but it made me cry as much, if not even more, than the book did. So I just had to buy the soundtrack, it has some amazing but emotional songs on it, especially All of the Stars by Ed Sheeran which never fails to make me cry! 17. What was your last musical ‘phase’ before you wisened up? I really don’t agree with this question! What kind of way to describe it is ‘wisened up’? That’s just rude! I personally hate when people call my love for a band/artist a ‘phase’, as though it’s something I’ll eventually ‘get over’, it’s so patronising. I’ve been in this ‘phase’ of loving One Direction for 5 years now so I think it’s well past a phase now. People told me three years ago that I’d soon be over it but I’m 21 now and I’m still not and I have absolutely no regrets about it. But before this turns into a full on rant you can read all about my thoughts on this subject in my post ’10 reasons I’m not ashamed to be a One Direction fan’ here. 18. What is your ‘guilty pleasure’ that you hate to admit liking? Again, I feel the same about this question as I did about the last one. I don’t think there’s any point liking a band or artist if you’re going to be ashamed of it! In my opinion there isn’t such a thing as ‘real music’, I can’t stand people who think their music taste is superior to others. Whatever you like, good for you – embrace it and don’t ever apologise or feel embarrassed to like a certain type of music! I really enjoyed answering these questions, and I hope it’s been a bit of fun for you guys to read as well and helped you get to know me a bit better! If you want to do this tag please feel free, I’m not directly tagging anyone but let me know if you do it and I’ll check out your answers!